OK, so I once again made an empty promise to myself. I didn’t begin working on my project until after seven tonight. As always I had the best of intentions….no excuses, just didn’t get to it. I did however spend a great deal of time putting my work in my new presentation portfolio that I received as a birthday present (thank you Dan). My old portfolio is at least thirty years old, the plastic pages were cracked and the zipper quit years ago. Over the last few months I have accumulated quite a bit of work and it needed a home. I still need to get extra pages for the new one. I am proud to say it is full right now. For my project tonight I began another acrylic painting. I so loved the results of my vintage shoe form painting from the other night that I have decided to do a series of paintings based on some of the vintage collectables I have. Warning: If you collect anything thing that has the name Bradford Exchange, Village 56, Thomas Kinkade, etc., you might want to stop reading here……………….. Have they gone yet? I mean the Disney people, the Precious Moments people, the people who collect any of the previously mentioned highly collectible, mass produced…crap. Sorry, I just feel that way. I don’t want to acquire number 121 of 500 of this year’s Christmas Village. I would never deny anyone the right to their own taste, but I really just don’t get it. I have seen just about every Disney movie because I have children. I love the classics, I particularly like the Genie in Aladdin. Robin Williams was great. I love Beauty and The Beast, The Little Mermaid and Cinderella. The Seven Dwarfs creep me out, particularly Dopey, he reminds me of a friend of my Dad’s when we were growing up. (Let’s see if my sisters know who I’m referring to.) My favorite character has to be Winnie The Pooh. No reason, just look upon him fondly. He was our high school mascot (be nice, it was an all girl Catholic high school, Pooh was as manly as we could get) I like Piglet, Eeyore (who I believe may be part Irish. I believe this based on my previously mentioned theory of glass not half full, not half empty, shattered on the floor because I’m Irish), and love the rest of the crew of the Hundred Acre Woods too, but not enough to have them on my fireplace, or on my toaster, or my bath towels, or God forbid, my pajamas. I had a Pooh collection once, but I was seventeen not forty. Again, I will defend your right to personal taste, but Precious Moments, really? I’ve been in houses where it looks like the gift shop at Disney World. I’m sure that these same people would come in my house and look at my vintage wooden shoe forms, and my McCoy Pottery, and the rustic industrial stuff and think it is…crap. That’s OK. Actually my Dad said something years ago about my house. He said it was full of shite (Irish for, well I think you can figure it out) I heard this from one of my sisters. He found out that I heard it and called to apologize. I was quick to agree with him. I said, “Yes Dad, I know, and it’s my shite and I like it.” I don’t think he knew what to do with that. I ‘m not offended if someone doesn’t look favorably on my taste, its mine, remember the “no peer pressure” I wrote about last night? I meant it. I like being different, I don’t want to have the same house with the same stuff as everyone else. I hope I haven’t truly offended anyone. (I feel Catholic guilt creeping into my brain as I write.) Anyway…I have some very interesting, well-worn and well-loved pieces. I think they deserve to be preserved for all eternity, or at the very least until my grandchildren throw them away. I only managed to color block a canvas for the painting, nothing worth posting, so I decided to throw another old favorite piece of art on the blog. Many, many years ago I came across a photo of Donald Sutherland in a magazine, his face was emerging from the dark. I loved it. A pencil portrait. 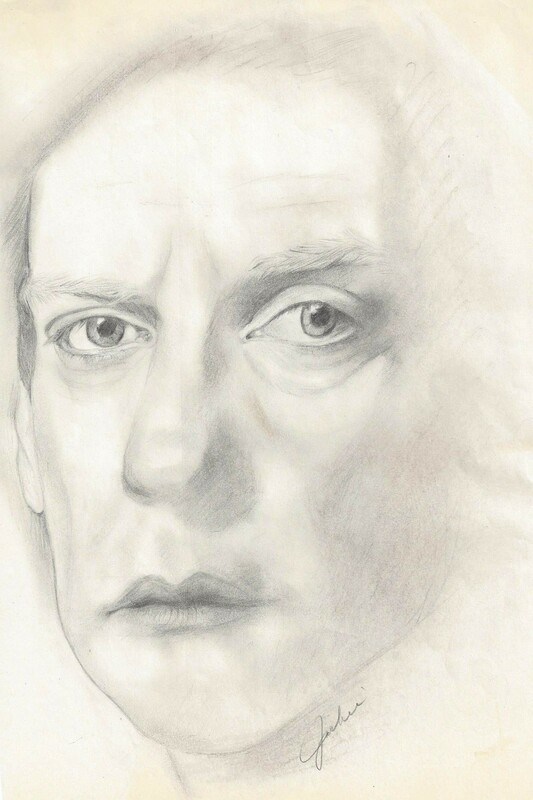 This entry was posted in art, Art and my life, Drawing, Family, Fine Art, Humor, Uncategorized, Words, Writing and tagged art, Donald Sutherland, drawing, Family, Fine art, humor, illustration, life, loving words, pencil drawing, projects, thoughts, Visual arts, writing. Bookmark the permalink. The leading source of art coverage since 1902.